Posted in: Dee Why. Tags: 8/10, SE-3m-12s. Light wind and surprisingly smooth as the day got started. More importantly though, the swell cleaned up a lot overnight and it was still pretty big. Wave faces on the bombs at Dee Why point were into the 2x overhead range. Definitely not a morning for beginners, or even a fair percentage of intermediates. The wind was offshore at 0630, but the forecast has it coming up from the south before weakening again in the afternoon into the 10 kt range. As of 0400, the MHL buoy was seeing a mix of NE and SE swell. The dominant SE component was close to 3 metres at 12 seconds. Solid, in a word. Next tide’s a high at 0750 and the low will follow at 1430. This morning looks like being the best few hours for a wave across the next week. That said, there could still be something of interest tomorrow morning at south magnets. I’m planning to spend some time at the beach this morning, so check back later for an update. Have a great Friday and stay happy! A complex low pressure system over the Tasman Sea is moving southeast and a strong high pressure system south of the Bight extends a ridge behind it directing southerly winds along New South Wales coast. Winds are expected to turn southeast to northeasterly during Sunday as the high moves over the southern Tasman Sea maintaining the ridge to the northwest. Southerly 10 to 15 knots, reaching up to 20 knots offshore in the morning. Winds turning east to southeasterly below 10 knots in the early afternoon. South to southeasterly below 10 knots becoming northeasterly in the morning then increasing to 10 to 15 knots in the early afternoon. Southeasterly 1.5 to 2 metres, tending southerly 1.5 to 2.5 metres during the morning, then decreasing to 1.5 metres by early evening. Deceptively powerful surf conditions are expected to be hazardous for coastal activities such as crossing bars by boat and rock fishing. Posted in: Dee Why. Tags: 8/10, SSE-3m-10s. Winds South to southwesterly 15 to 25 knots, reaching up to 30 knots during the afternoon and evening. 1 to 1.5 metres, increasing to 1.5 to 2.5 metres during the morning. Southerly 2 metres, increasing to 2 to 3 metres during the morning. Your correspondent will be heading away from the beach and into town to do a bit of radio with Simon Marnie on 702 ABC, so no surf activity for me until this afternoon. Get out there and catch me one, okay? Posted in: Dee Why. Tags: 8/10, SE-2.5m-14s. Swell was 2.5 metres at 14 seconds apart from the south to SE and wind was lightly offshore under mostly clear skies at 0645. Set wave faces at the point were 1.5x overhead for the already healthy crowd. Consistency seemed to be pretty good too. Sets along the beach were a similar size but the banks continue to look pretty iffy, with long rides the exception rather than the rule. I’m calling the point 8/10 and the beachy 6/10 (for lack of banks). Tide is heading to a low at 1035. The Bureau’s modelling has the swell dropping back into the two metre range as the day goes along. And tomorrow should be smaller again, but still with fun size waist plus sets at magnet spots. It’s set to cog down again on Thursday and be pretty small on Friday. So get out and enjoy if you can and say hi if you see me wandering around with the camera! A high south of Tasmania extends a ridge along the New South Wales coast. The high should be centred over the Tasman Sea by Wednesday. A cold front is expected to reach the south coast Thursday morning bringing southerly winds which should then extend north along the coast before stalling on the Mid- North coast on Friday. Variable about 10 knots becoming northeasterly 10 to 15 knots in the evening then decreasing to about 10 knots in the late evening. Southerly 2 to 3 metres, decreasing to 2 metres later in the evening. North to northeasterly 10 to 15 knots, reaching up to 20 knots offshore in the late evening. Below 1 metre, increasing to around 1 metre during the morning. Southerly 1.5 to 2 metres, decreasing to 1.5 metres by early evening. Northerly 15 to 20 knots shifting south to southeasterly 10 to 15 knots during the day. South to southeasterly 1 to 1.5 metres. Posted in: Surf Reports. Tags: 159d, 18C, 8/10, SSE-4.5m-13s. Short version: at 0700 there were heaps of waves at Dee Why with solidly overhead sets being pretty common. Quality wasn’t too bad either thanks to light west breezes and a low tide at 0845. The MHL buoy was showing 4.5 metres of 13-14 sec S-SSE swell as of 0400. Swell is expected to drop steadily today, but it’s not going to go away entirely. Wind will be shifting to the E-NE around lunchtime, so this morning is clearly going to offer the widest range of choices. Outlook is for the swell to continue to fade and be back to small tomorrow when S-SE wind will make a mess of most places from early. Have a great Thursday one and all! A relatively weak cold front is expected to reach the South Coast late Thursday then move along the remainder of the coast during Friday with a fresh southeasterly change associated. A high pressure system is forecast to develop over coastal NSW later Friday and early Saturday then move over the Tasman Sea. Another, somewhat stronger southerly change may reach the South Coast late Sunday. West to southwesterly 10 to 15 knots shifting east to northeasterly in the early afternoon. Southerly 2.5 to 4 metres, decreasing to 2 to 2.5 metres during the morning. Large and powerful surf conditions in the morning are expected to be hazardous for coastal activities such as crossing bars by boat and rock fishing. Variable about 10 knots becoming south to southeasterly 15 to 20 knots early in the morning. Southerly 1.5 to 2 metres, decreasing to 1 to 1.5 metres during the morning. Southeasterly 10 to 15 knots becoming variable about 10 knots during the day then becoming east to northeasterly 10 to 15 knots during the afternoon. Posted in: Dee Why. Tags: 8/10, Long Reef, SSW-2m-14s. Looked as though everyone was in the water today. I don’t think I’ve seen so many spots so crowded in a very long time. The morning started nearly flat, but by 1100 or so all the south magnet spots were firing up big time. The wind got pretty strong in the middle part of the day, but by late afternoon it had dropped back and the joint was jumping. 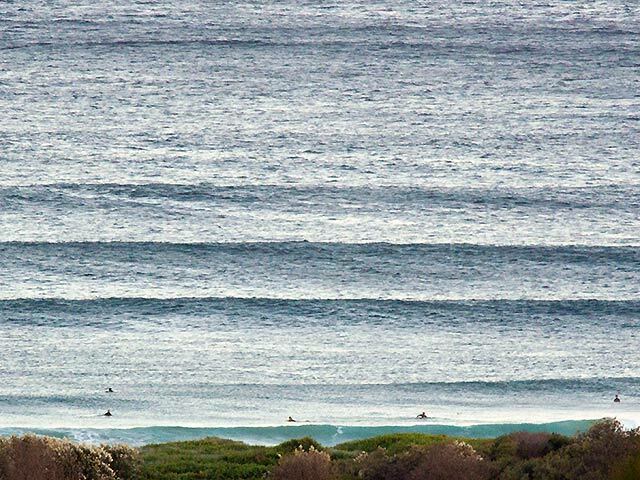 I got a few pictures of the am session at Long Reef and I’m currently uploading a representative sample to my galleries. There was a comp on and they had their own shooter, but hey, you never know, maybe I got the better shot of you…! Anyway the pics should be online for you tomorrow. As of 1600 the swell was showing in Sydney as mainly from the SSW at a couple of metres but packing a serious 14 second period. Wave faces were shoulder to overhead and a half at Dee Why. The beach was mostly shutting down because the lines are so long, but the point was showing in a big way. Swell seems to have peaked down south, so I’m thinking it’ll do the same overnight for us. The big question is whether or not the low will move out into a more SE swell window. I sure hope so because I’m committed to a trip north and I don’t want it to miss us. While the swell will drop back, the outlook for the remainder of the week remains ok for wave energy. It looks like we get a south change through on Tuesday, so the offshore regime will be replaced by a much less favourable southerly one. And it’ll also be back to showery weather as well. But there should be surfable size swell through next weekend and the winds will likely go SW in the mornings. All good! Have a great Sunday evening and catchya again tomorrow morning! A deep complex low is located east of Tasmania. Strong to gale force winds should ease by late tonight as the low moves away and the next high pressure ridge extends across from the west to be centred to the west of Tasmania for several days. This high should direct a southwest to southerly airstream along the coast before moving to the southern Tasman Sea later in the week. Westerly 20 to 25 knots, reaching up to 30 knots at times. Southerly 2.5 to 3 metres, increasing to 3 to 4 metres offshore later in the evening. West to southwesterly 15 to 20 knots decreasing to 10 to 15 knots in the afternoon. 1.5 to 2 metres, decreasing below 1.5 metres during the morning, then decreasing below 1 metre around midday. Southerly 3 to 4 metres, decreasing to 2.5 to 3 metres around midday. Westerly 10 to 15 knots turning southerly 15 to 25 knots in the late morning. Around 1 metre, increasing to 1.5 to 2 metres around midday. Southerly 1.5 to 2.5 metres, tending southeasterly 1.5 to 2 metres during the afternoon, then tending southerly 2.5 metres later in the evening. Posted in: Dee Why. Tags: 135d-2.4m-10.8s-23C, 8/10, SE-2.5m-11s. Can you get to the beach? Looks like it’d be a plan if you can. Dee Why was busy with the holiday crowds, but there were lefts along the beach (and the odd right) along with a fairly steady supply for the crew at the point. Size ranges from chest to head plus thanks to a 2.5 metre, 11 second period SE swell. Wind early is out of the west, but it’s due to swing south 15-20 kts later. Don’t feel too bad if you can’t play today though, because as the models have been telling us for days now, it’s only going to get better! 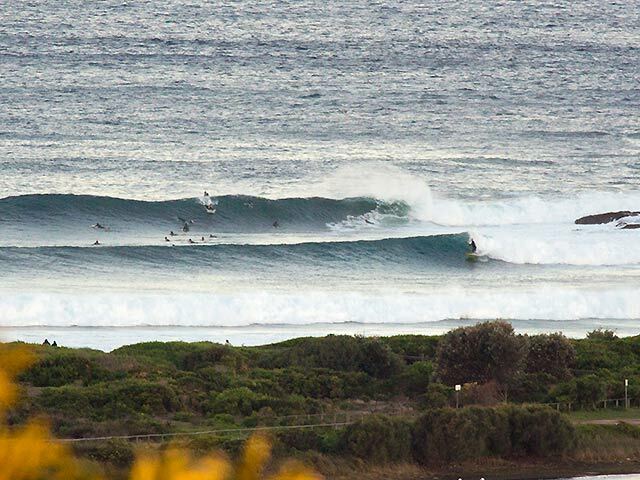 The outlook is for solid SE swell, light offshores and sunny skies for Friday-Sunday. Woohoo! Next tide is a high at 0900 and the low will be along at 1520. A high to the west extends a strengthening ridge of high pressure over New South Wales today, while a deep low remains over the eastern Tasman Sea. The ridge is expected to remain the dominant feature in the region over the next few days, briefly weakening during Friday as a frontal system passes across the south, before reasserting itself on the weekend. South to southwesterly 10 to 15 knots turning westerly 15 to 20 knots in the morning, and reaching 25 knots offshore in the evening. Around 1 metre, increasing to 1 to 2 metres offshore by evening. Southeasterly 1.5 to 2.5 metres. Southwesterly 15 to 25 knots decreasing to about 10 knots during the evening. Southeasterly 2.5 to 3 metres. Posted in: Dee Why. Tags: 149d-3m-11.4s-23C, 8/10, SE-3m-11s. Brilliant looking conditions as Monday got started. Definitely for the fit and experienced only out at the point. Wave faces were anywhere from head high to double, maybe double plus on the bombs. Swell is out of the SE at 11 seconds apart with a height at sea of 3 metres (up to 5 metres when you add in the seas). Not super crowded at the point, but you won’t be Robinson Crusoe either. Wind is going to be southerly 15-20 kts soon (it was SW for the early sesh) and then will be SE in the evening. Showers are coming along later too. Tide was high at 0805 and the low will arrive at 1330. This morning’s swell models are saying it should kick along at a little below the current size through to Saturday. I went shooting Saturday and yesterday at the point, and I may just take a few more snaps today. Have yourself a fantastic Monday and take care if you’re getting in. A low pressure system over the Tasman Sea slowly tracks to the southeast followed by a high pressure ridge strengthening across the region into the new week. Southerly 15 to 20 knots turning southeasterly 10 to 15 knots in the evening. 1 to 1.5 metres, increasing to 1.5 to 2 metres during the morning, then decreasing below 1.5 metres during the afternoon. 1.5 metres, increasing to 1.5 to 2 metres during the afternoon. Posted in: Dee Why. Tags: 8/10, 93d-1.8m-14.8s-22C, E-1.8m-15s. For close to two weeks it was looking like today might be the goods, and lo and behold, so it is. Swell is much cleaner this morning than 24 hours ago and it looks to be just about the same size, but maybe a touch smaller on the biggest ones. That said, when I took the pictures, there was a nice clean up set that pretty much took everybody at the point by surprise. That’s the deal when you have an average period of close to 15 seconds – the bombs can be 15-30 mins apart. Swell was just a touch under the two metre mark at 14.8 seconds from the east and wind was out of the WNW as things got started. The wind should be good most places until it swings NE in the afternoon. I got a ton of pics yesterday and will be out and about with a camera again today. Swell looks like dropping away pretty quickly through the day and tomorrow, while still fun-size, should be noticably smaller. The rest of the week looks small to marginal, but the models are showing another dose of the big stuff next Sunday-Monday! Both crowds and waves are a bit smaller than yesterday – but cleaner. Big one sweeps the crowd. A weak ridge of high pressure is extending across New South Wales today in the wake of a trough and cold front, which is near the Queensland border this morning. This ridge will remain over the region during the early part of the week, leading to a fairly weak pressure pattern. Note that a powerful easterly swell is affecting most of the coast today, courtesy of ex-Tropical Cyclone Lusi near New Zealand. Southwesterly 15 to 20 knots becoming variable about 10 knots by the middle of the day then becoming northeasterly 15 to 20 knots in the afternoon. 1.5 metres, decreasing below 1 metre during the morning, then increasing to 1 to 1.5 metres by evening. Easterly 1.5 to 2 metres. Northerly 10 to 15 knots becoming south to southeasterly 10 to 15 knots during the afternoon. Posted in: Surf Reports. Tags: 135d-2.2m-11.4s, 8/10, SE-2m-11s. Get out there if you can. It was going off this morning as all the elements came together: light wind, 2 metres of 11 sec SE swell and sunny skies to make it all pretty like. Extremely crowded for some odd reason, so you might want to take that into account. But on the other hand, this is the best looking morning I’ve seen in a very long time. And there should be lots of beaches lighting up. Swell is supposed to fade this morning, but at least we’ll have an incoming tide from the low at 0940 to give a little push. The high is very small (only .5 m), And the wind isn’t supposed to be much of a factor until late afternoon when it’s set to go NE at 10-15kts. A high pressure system will linger in the southern Tasman Sea extending a ridge over northeast New South Wales into the weekend. Winds will tend east to northeasterly over the next few days freshening in the south as the next trough approaches from the west, followed by a southerly change later on Sunday and into Monday. Variable about 10 knots becoming northeasterly 10 to 15 knots in the late afternoon. Southeasterly 2 metres, decreasing to 1.5 metres during the morning. North to northeasterly 10 to 15 knots, reaching up to 20 knots offshore in the evening. Around 1 metre, increasing to 1 to 1.5 metres offshore by early evening. Southeasterly 1.5 metres, decreasing to around 1 metre. Posted in: At large. Tags: 162d-2.8m-11.4s, 8/10, Collaroy, Dee Why beach, dee why point, SE-2.8m-11s, South Narrabeen, Whiterock. 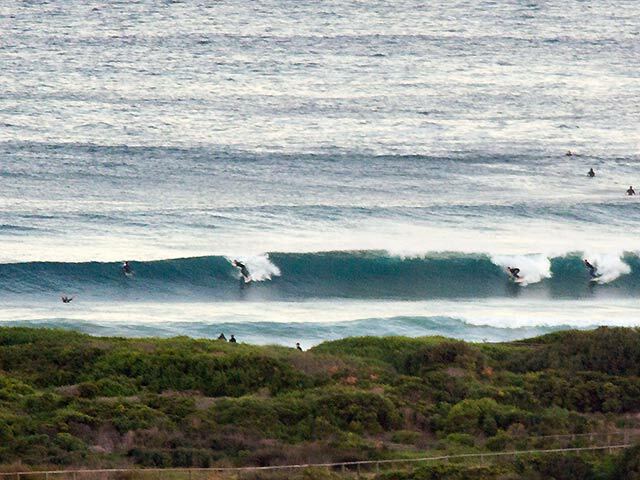 Close to 3 metres of 11 second SE swell rolling in with light offshores and sunny skies as Saturday got started. Wind is set to be light until this evening when it will get up to 10-15kts from the SE. Next tide is a big high at 1120, followed by a low at 1810. There are some serious looking sets in the mix at exposed spots, so this is definitely not a day for beginners at most places. If you want a quiet sesh, maybe check out the protected south corners because anything with good exposure to this swell will be showing sets into the overhead range. Swell looks nice and juicy too thanks to the healthy 11 second period. Pay attention and be prepared to share because it was already very busy at Dee Why before 0700. Swell is set to peak today and then drop away pretty steadily over the next 36-48 hours. With luck we’ll get waves pretty much all day and then again tomorrow before the wind gets into it and maybe even a few scraps Monday morning. Go well and have a top old day! ps: will be out and about with a camera today so hope to have some snaps for you later! Forecast issued at 4:10 am EDT on Saturday 7 December 2013. A deep low pressure system lies over the Tasman Sea near New Zealand, and a high expands over the southeastern Australia. A south to southwesterly airstream between these two systems is weakening as the low moves further away to the east. During Saturday the high will drift slowly across New South Wales, with coastal winds mostly becoming northerly on Sunday as the high reaches the Tasman Sea. The next trough is expected to bring a southerly change during Tuesday and Wednesday next week. Around 1 metre, increasing to 1 to 1.5 metres during the morning, then increasing to 1.5 to 2 metres around midday. Northerly 15 to 25 knots turning northeasterly during the afternoon. 1.5 to 2.5 metres, decreasing below 1.5 metres during the morning. South to southeasterly 1.5 to 2 metres, decreasing to 1 to 1.5 metres.